There's only 25 games left after the break and we'll have a new thread for the offs so might as well get it started now. watched replay of that game, 1st full game I've seen of Nuggets in a couple years or so. Jamal Murray sure is...something eh? he hit like 4 3s in a row with the net barely moving...and then threw 2 of the most ridiculous (as in awful) passes I've ever seen in an NBA game. he's still figuring it out and has to play pg until they find one. but its fun surrounding jokic with all that shooting. wilson chandler not looking like a corpse of late is helping too. its a crime that game wasnt televised last night. yeah they are a super fun team offensively. I didn't even know Chandler was still in the league! He looked really good. Kobe Bryant didn't mince words when he told ESPN's Jalen Rose that only a "special" kind of player can be a Los Angeles Laker. The future Hall of Famer, who played his entire 20-year career with the Lakers, was asked whether he would help the team recruit free agents this summer, given the amount of salary-cap space and young talent the franchise has as it attempts to climb back to a championship level. After laughing off the idea of "coddling" players (or "babysitting" them, Rose suggested) and boasting his rings and team banners, Bryant didn't hold back. "You know, the thing about this franchise is that you shouldn't need recruiting to come in it," Bryant said. "It takes a special person to want to play for this franchise, and take the pressure that comes along with playing for this franchise. The pressure of following Magic [Johnson]'s footsteps, myself and the dynasty that we've had, it takes a special person to do that. "And if I need to convince you come here, to carry that legacy forward, then you ain't the one to be it." The Lakers have 16 championships and last won in 2010, when Bryant was named Most Valuable Player of the Finals for the second straight year. Bryant won five championships as a Laker in seven trips to the Finals; Johnson won five championships in nine Finals appearances. "When you're here, the most important thing is winning championships. I don't care about anything else. It's winning championships," Bryant said. "You don't have to like each other, but you will show up to practice every day and play hard, you will focus and commit to winning, and you know, if that's the case, then you'll be just fine." "And if not?" Rose asked. "Then you can go play someplace else," Bryant said. "That's fine, too. I mean, it's a certain personality that comes along with it. It's a brand thing. I mean, the Lakers stand for excellence. They stand for winning. We don't hang division banners. You know what I'm saying? We don't do that. We don't retire everyone's jerseys. We retire Hall of Fame jerseys. "... The people that are here need to be able to lift that standard and hold themselves to that standard. Which in turn gives you the ability to hold everybody else to that standard. If you can't do that, you can't be here." 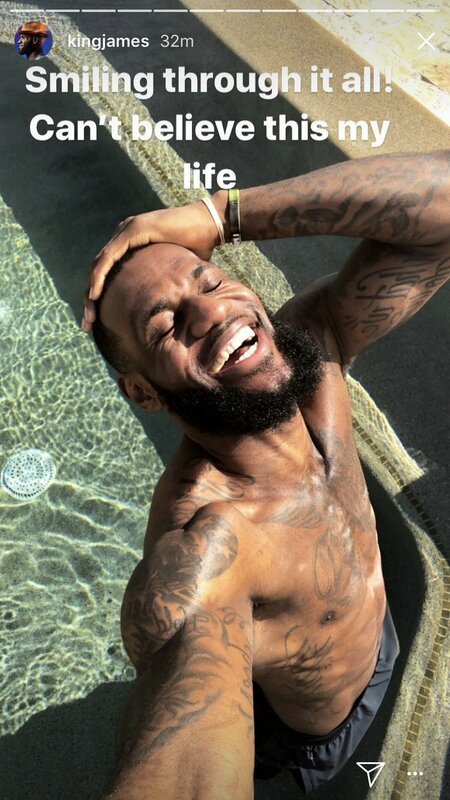 The Lakers are 23-34 at the All-Star break. They haven't reached the playoffs since the 2012-13 season. is this the latest in the season the ASB has been in a while or is it just me? Should Warriors trade Klay for LeBron? Stephen A. Smith and Max Kellerman disagree with a hypothetical offseason move for Golden State to trade Klay Thompson for LeBron James. Yeah Dawkins editing is incredible and he gets them up so fast. I hope there's a Uncle Drew .5 like the Jackass movies. are there any coach of the year frontrunners? pringles again? yeah it ocurred to me today that there isnt a standout like in years past. even the raps probably owe their success more to masai than casey. The NBA already has participation trophies. It's called a paycheck. You've never seen a framed check at a business? tsk tsk. But to be honest, division winner banners are already crossing the line. These all go WAY over the line. Participation trophies would be better. I like how Pop has (imo) clearly passed Phil Jackson in terms of who is regarded as the greatest modern coach. yeah, pop is awesome. he's a pretty great hoops coach, too. Popovich has all the bonafides of Jax w/o any of the negatives and patchouli stink. i guess what it comes down to is what do you value more: chip count (for which phil is untouchable) or sustained excellence. to phil's credit, neither the bulls nor the shaq-kobe lakers teams ever won titles without him, but they also represent some of the most stacked teams of their eras. pop drafted good players and helped make them great and won 5 titles, many of them rather improbably. he's made the playoffs every year and did so without ever leading the league in salary (i'm not sure if they've even ever been top 5). Skipping 2037 messages at this point... Click here if you want to load them all. Brad Stevens would coach this Denver team to 55 wins in the West. Don't @ me. nuggets with one shot for the playoffs! the whole overtime has had shot clock pressure. dudes are trying to catch a couple seconds of rest and getting into actions super late. What a game. Grats to Matt sorry to kev and other nuggets fans. jokic +7 tonight. really proud of him even tho he’s gonna beat himself up over those last 6 minutes. so MIL and MIA finish tied, who loses the tiebreaker and thus plays the celtics? Clay, there was a brief moment early in the season when you repped for McCollum as better than Dame. Was that a passing thought, or still your opinion?